Legendary musician Daniels to ..
MTSU students, faculty, staff ..
MTSU proudly accepted the annual “blood battle” challenge trophy for the sixth time in its eight-year competition with Conference USA rival Western Kentucky University, but once again, the true winners are the 3,000-plus neighbors across several states whose lives may be saved by the 1,015 total pints of blood donated this year by the universities’ supporters. MTSU donors rolled up their sleeves to give 603 pints of whole blood Oct. 29-31, beating the university’s self-imposed three-day goal by 141 pints. WKU beat its 2018 donation goal by 18 much-needed units, collecting 412 pints on the Bowling Green campus over the same three-day period. This 2018 MTSU tally is nearly a record-breaker, second only to its 2012 collection of 618 pints of blood. 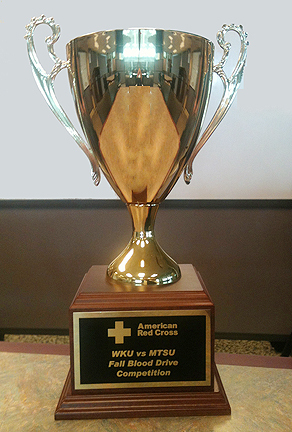 WKU set its own record in 2012 to win the challenge trophy with 637 units of donated blood. 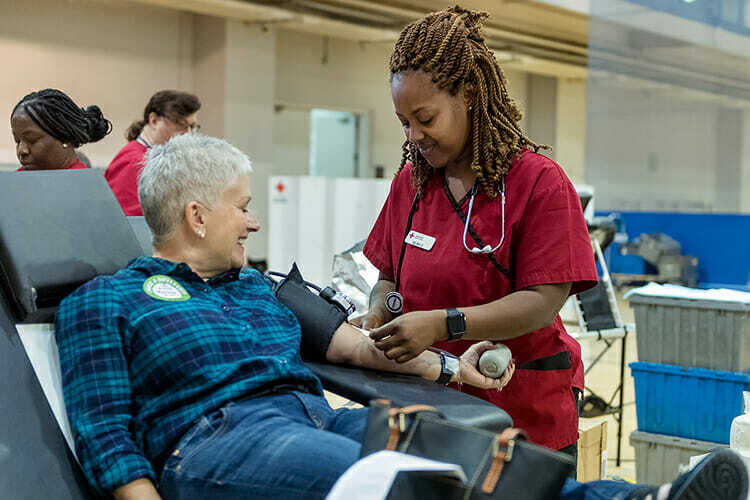 “We were hoping that MTSU wins this year, but really we know it’s the community that wins in this blood drive,” said Kathy Ferrell, executive director for the Murfreesboro-based American Red Cross Heart of Tennessee chapter. MTSU supporters are now six-time champs in the “Bleed Blue, Beat WKU” challenge, helping to collect almost 8,705 total pints of blood — more than 1,088 gallons —with WKU since 2010. 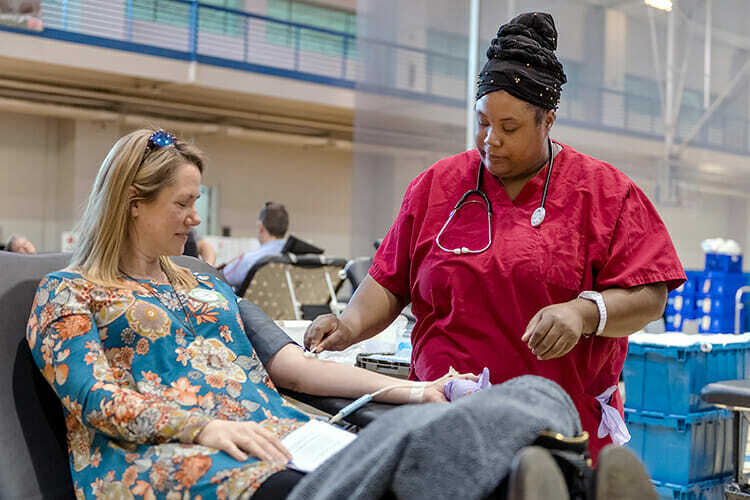 Because each unit of blood can aid three different patients, the competition has helped more than 26,115 people across Tennessee and parts of Kentucky, Illinois and Missouri. In effect, MTSU and WKU donors have saved almost the equivalent of the city of Bristol, Tennessee, in Sullivan County. Bristol’s current population is 26,842, according to U.S. Census Bureau figures. The annual challenge trophy was presented at the MTSU vs. WKU football game in Floyd Stadium Nov. 2, and Keith Huber, senior adviser for veterans and leadership initiatives at MTSU and a retired U.S. Army lieutenant general, accepted for the university. Huber helped to encourage donors with his personal story of lifesaving blood on battlefields and in operating rooms. “I saw the value of blood to the men and women in uniform that I served and during the most dire circumstances of injuries or combat-related incidents,” he said of his 38-year military career, “and also to my family as I watch blood being provided by others. Ferrell noted that the “blood battle” success will help local Red Cross organizations rebuild supplies already decimated in the wake of blood-drive cancellations forced by Hurricanes Florence and Michael. She added that the need for blood is constant and increases during holiday travel. “The need is great, and MTSU is leading efforts to meet that need,” she said. Those who were unable to donate during MTSU’s blood drive can visit www.redcrossblood.org anytime and type in their ZIP code to make an appointment at another local drive or blood donation center. Want to help make a True Blue difference in the MTSU community? Make an appointment today to donate blood Monday-Wednesday, Oct. 29-31, to save our neighbors’ lives — and continue our winning streak in the eighth annual blood drive competition with Conference USA rival Western Kentucky University. Donors can schedule an appointment from 10 a.m. to 6 p.m. Oct. 29-31 inside MTSU’s Campus Recreation Center, 1848 Blue Raider Drive, by visiting www.redcrossblood.org and typing in “MTSU” or using the “American Red Cross Blood” app, available here. Walk-in donors are welcome, but those with appointments will be processed first and finish their donations faster. On donation day, donors can save even more time by completing the “Rapid Pass” online health questionnaire at www.redcrossblood.org/rapidpass. MTSU supporters are five-time champs in the “Bleed Blue, Beat WKU” challenge, helping to collect almost 7,700 total pints of blood — more than 961 gallons —with WKU since 2010. Because each unit of blood can aid three different patients, the competition has helped more than 23,000 people across Tennessee and parts of Kentucky, Illinois and Missouri. That game also will serve as MTSU’s annual “Salute to Veterans and Armed Services” celebration honoring U.S. veterans and active-duty military personnel. Keith Huber, senior adviser for veterans and leadership initiatives at MTSU and a retired U.S. Army lieutenant general, has seen blood save lives on battlefields and in operating rooms where loved ones lay. It’s even saved him. “I would pray that the public doesn’t need to face those life-and-death situations and the trauma associated with it to recognize that blood collection is essential. … So many people go, ‘Gee, you know I want to help people, I want to make a contribution, I want to give back to society, to our community, to our nation.’ And then they come up with this excuse of ‘But, but … gee, I don’t know how. How do I get there? How do I provide something that is of value?’ Here it is. Here’s the answer. Huber explains more about the need to serve our community by donating blood in the brief video below. “Please know that we have lost the opportunity to collect over 7,500 pints of blood as a result of blood drive cancellations in the aftermath of Hurricanes Florence and Michael,” Ferrell said, noting that the loss could affect up to 22,500 patients across the country. MTSU donors can prepare for their appointments now by cutting back on caffeine, eating iron-rich foods and getting extra rest. Visit the Red Cross website for more blood donation suggestions. For directions to the Rec Center, visit www.mtsu.edu/camprec/directions.php.